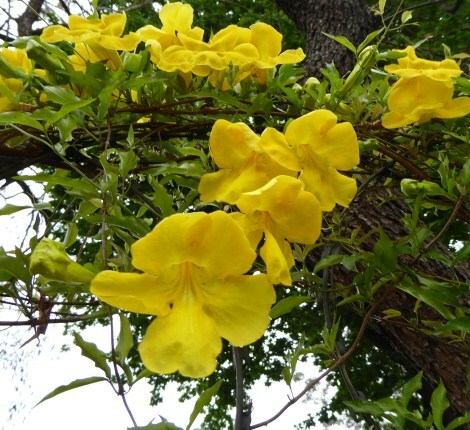 I have to admit that I roll my eyes at some of the plants on the official list of alien invasive plants in South Africa but the cat’s claw creeper (Dolichandra unguis-cati, formerly Macfadyena unguis-cati) is not one of them. Rather spectacular yellow flowers and quick and easy growth have made this South American native a popular hedging plant or screen for unsightly walls the world over, including in South Africa. Gardeners seem to have done their best to pop it in all over the place and it has been declared a Category 1b weed. The plant gets its name from its distinctive leaves which consist of two leaflets and a modified three-forked tendril that resembles a claw with a tiny hardened hook which attaches easily to almost any surface (including your clothes and skin!). As a result it has no trouble very quickly scaling walls or tree trunks and is a real menace once it has found its way into a shrub. I know from experience that this climber spreads rampantly and is extremely difficult to eradicate. If like me you have been faced with trying to rid yourself of this pest, you will know what a frustrating task it is. Apart from its profuse seed production, cat’s claw sends stems out along the ground which readily develop roots and tubers wherever a node touches the ground - and lo and behold, you have another unwelcome surprise guest in the garden. The subterranean tubers are what make the plant so resilient because they re-sprout with ease if the parts above ground are damaged, removed or poisoned. Not surprisingly, finding ways of dealing with this scourge has kept the Agricultural Research Council’s Plant Protection Research Institute busy for more than 20 years. The current thinking seems to be that biological control is the only practical long term solution to cat’s claw creeper infestations and seven potential insect biocontrol agents have been investigated. Four of these have supposedly been released into the country but clearly nowhere in my vicinity! It seems one has to resign oneself to an ongoing battle of detection and removal. I would be interested to hear if anyone has stumbled across a method that works. Click here to see the newsletter with images. I could fill more than one newsletter with what is happening in the garden at the moment but must keep myself in check. One of the many delights of spring is still rediscovering deciduous plants that were semi-forgotten over winter and now seem to burst into bloom and leaf virtually overnight. See below for some of the deciduous specimens we have in the nursery. 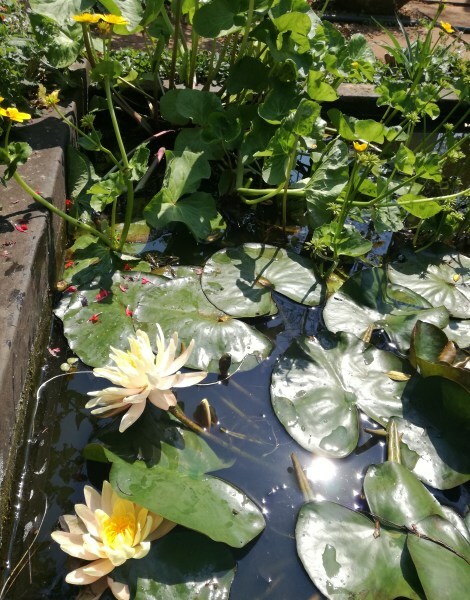 For the first time in five years we have no “doggy bars” covering our ponds to keep Molly from cavorting around in the water, putting paid to all our water plants in the process. She doesn’t seem to have realised yet that they have been removed and long may that last. It is such a pleasure to have uninterrupted views of the gorgeous yellow Caltha palustris and other water plants. Justicea petiolaris is a 60 cm high upright perennial with attractive pale green foliage and pale blue lipped flowers all season. It likes part shade and is hardy and evergreen. Self-seeding. The compact evergreen perennial Linum africanum has small green leaves and upright stems with lovely yellow flowers in summer. It is hardy and grows about 40 cm high. It can take sun or semi shade. If you are on the lookout for a fast growing evergreen shrub that flowers all season (aren’t we all!) try Pavonia praemorsa. It has tough stems, roughly textured leaves and apricot buds that bloom into pale yellow flowers that attract birds, bees and butterflies. It likes sun and reaches an average height of 1.5 m. It is also self-seeding. The large scented white flowers of Xylotheca kraussiana attract birds and butterflies in summer. 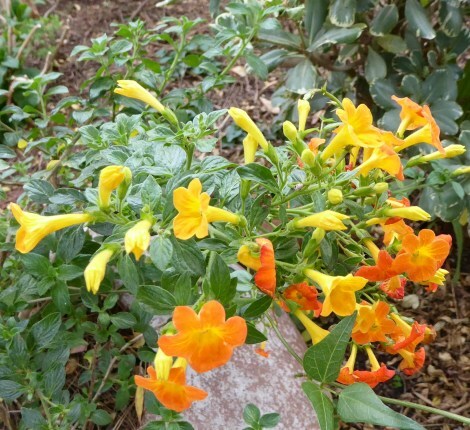 This multi-stemmed evergreen shrub grows about 3 m high, is semi hardy and likes semi shade. Clematis montana is a vigorous and very hardy climber with a froth of four petalled white flowers in spring. It is deciduous, reaches an average height of 6 m and since it is a Group 1 clematis, does not need to be pruned. Plant in semi shade. Hydrangea quercifolia is another deciduous plant with lovely creamy white flowers in spring. 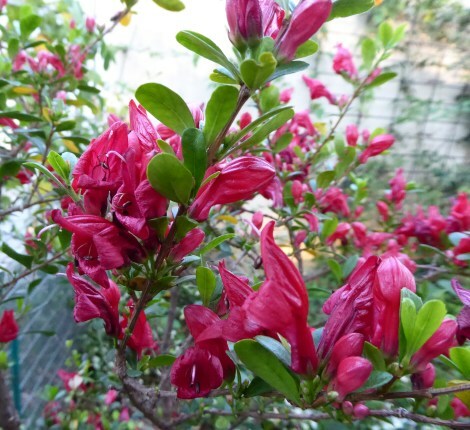 This is a large shrub (average height 1.5 m) with large, deeply lobed leaves and conical heads of flowers that last well into autumn when the foliage turns a rich bronze red to purple. The sterile flowers also become pink to bronze with age so the plant can really be enjoyed all year. Phlomis lanata is a compact water-wise Mediterranean shrub with woolly crinkly grey green leaves and whorls of yellow flowers from spring to summer. It is evergreen and very hardy and reaches an average height of 90 cm. Plant in full sun. I grew up enjoying “cornflowers” in my mother’s garden. Today I know that they are actually called Stokesia laevis. This is a clump-forming perennial with dark leathery leaves and frilly daisy like blue flowers, that attract butterflies and bees in summer. Growing to about 30 cm in height, it is evergreen, very hardy and likes a sunny position. We also have the white form in stock. For those of you who live in or will be visiting the Cape area, make a note of the Rare Plant Sale taking place in Stellenbosch at Tokara Wine and Olive Farm on the Helshoogte Road on Saturday 20 October from 09h00 – 15h00. Thanks to all those who braved the sudden cold front to visit our open weekend. A lovely time was had by all! Enjoy the rest of this wonderful season in the garden. So much to see, so much to do, so little time.